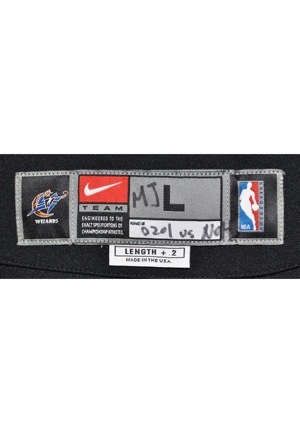 On the rear collar is the Nike manufacturer's tag size “L”. Next to the size handwritten in black marker is “MJ” There is a hanging flag tag below that reads, “LENGTH+2 MADE IN THE U.S.A.”. Adjacent to the right there is an “NBA AUTHENTICS” tag. On the name tag reads “0201 vs NOH” handwritten in black marker. 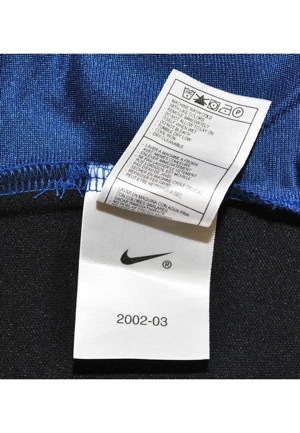 On the left inseam are two tags, one with the jacket materials and washing instructions and the other is a Nike tag that reads, “2002-2003”. On the right chest is the official “NBA” logo and white Nike Swoosh logo that are both embroidered. On the left chest is the official Washington Wizards team logo patch sewn on. 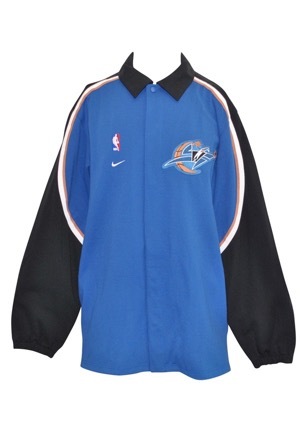 On the back below the collar is a white Nike Swoosh embroidered. 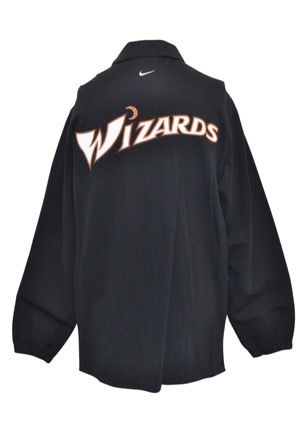 Below reads, “WIZARDS” done in white on copper on black triple tackle twill. This jacket is properly tagged, was presented to us as player-worn and shows use.